Relationships That Last a Lifetime | It's In The Sauce! When I think of being 65 years old, I am amazed. How did I get here so fast? Those reading this who are near my age or older know exactly what I mean. Younger readers may think they understand, but really can’t. There is something about aging that must be lived to be understood. While I am amazed at being this age, I am also grateful for the gift of age. We all know some people who did not make it to this age. Both my mother and my maternal grandmother died at 64. I worried about that in my 64th year. My father-in-law, who is 93, said the same thing about living past the ages of his siblings when they died. Perhaps this fear of not living longer than our siblings, parents, or other relatives is universal. Being grateful for aging is not just about the years in our lives, but the life in our years. It is our relationships and our experiences that create the tapestry of our lives. As I think of this, several experiences and relationships come to mind. Mike and I will celebrate our 33rd anniversary this April. There are many wonderful memories of those years. (And to be honest, a few not so wonderful, as many people can say!) One of our regular experiences through the years has been the Wilson Cotillion. Mike and I have been a part of this group longer than we have been married, forming the Wilson Cotillion in 1983 with 12 other couples. 34 years later, although we moved from Wilson to Raleigh in 1988, we still go back for the events of the Cotillion. (The photo accompanying this article is from our most recent dance at the end of January.) Just like everything else in life, the group has changed through the years. Some of the original members have died, some have moved, and some have divorced. The same is true for members who have joined since the group’s inception. There have been many additions to the group. But although the group has changed, our commitment to it hasn’t. We enjoy remaining connected to the people and the events. 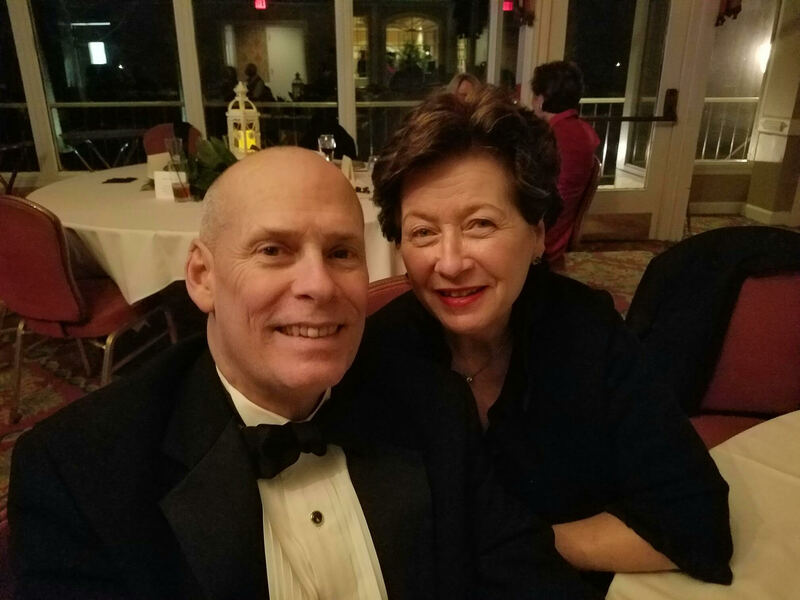 There are several couples in the Cotillion who we consider close friends, and spend time with several times a year, separate from the Cotillion events. There are other people from our early years together that Mike and I remain connected to, and some of those are more family than friends. We have been together during the early years of our marriages, the marriages of our children, and the births of our grandchildren. Our times together have filled our lives with memories that have carried us through tough times, including the deaths of some of these dear friends. It is true what we have heard for years, that when we are no longer physically present, it is our memories and photos that will remain. We have remained connected to these friends although there are several states between us. I wonder if the commitment to relationships and shared history is as strong in younger people as it is with many in my generation, especially when there is physical distance that makes it difficult to stay connected. These relationships are not Facebook friends. While I enjoy my Facebook friends, many of those connections are not friends at the same level of those I mentioned. Staying connected to Facebook friends is much easier than staying connected to friends who live several states away. There is a different level of commitment to relationships that require we do something more than click on a device and post (usually) only the good stuff about our lives. Do close relationships matter? Aren’t we so busy that we should just accept that there are friends at different times in our lives, and as those times change, our relationships do as well? This is true to a point. It is true that it isn’t possible or even desirable to stay connected at the same level with all the people in the different stages of our lives. It is fine to let some relationships go. It is also true that we need to treasure the relationships that sustain us. My latest book, A Year in the Life of a Recovering Spendaholic, is soon to be released. The book is a journal of my yearlong journey of changing my spendaholic behavior, a journey that occurred more than ten years ago. My friends who are family (as well as family!) will find themselves within the pages. As I recently reread the book during its editing stage, I was reminded of the value of these relationships. During that year’s journey, I connected to the importance of relationships, and my struggles with food and money. I will likely always love beautiful things, and will continue to be challenged with purchasing more than I need, for this is about “recovering,” not being “recovered.” I am very clear, however, about the importance of “things” compared to the importance of relationships. In fact, there is no comparison. This entry was posted in Relationships and tagged friendship, lifelong friends, relationships. Bookmark the permalink. Thanks so much, sweet Pam!